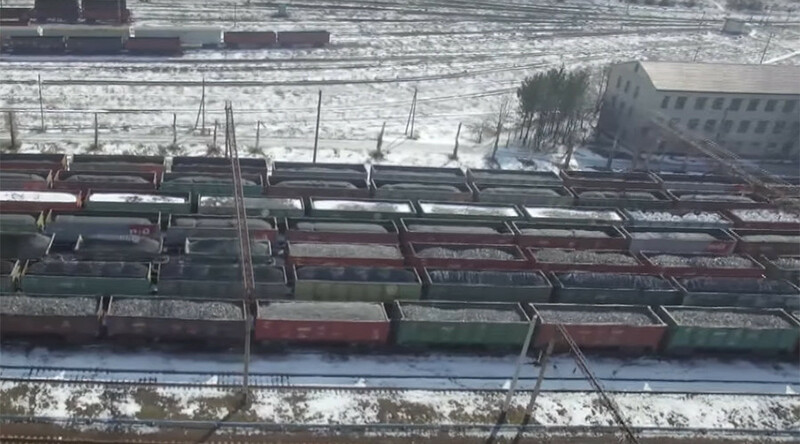 Drone footage has captured seemingly endless lines of railway cars loaded with coal stuck near Yasynuvata village in Ukraine’s Donetsk Region due to a blockade of rebel-held Donbass by pro-Kiev activists. The rail tracks were cordoned off a month ago by nationalist MPs and activists, including former members of voluntary paramilitary battalions, which took part in a crackdown on rebels, in parts of the Donetsk and Lugansk Regions. The blockade organizers claimed on social media that they have stopped around 74,000 cargo cars from crossing the disengagement line between Kiev-controlled and rebel-held parts of Ukraine. The nationalists have justified their actions by saying that buying coal from mines controlled by the rebels is treason and are not moved by concerns that without the fuel Ukrainian power plants would be forced to shut down. Earlier this week, the Mironovskaya power plant became the first in the country to stop production due to lack of anthracite coal supplied from the Donetsk Region. Some of the MPs behind the blockade threatened to seize power plants if rolling cuts happen.